As the seasons begin to transition we can’t help but feel a change in ourselves…some sort of mysterious transformation…and what better time to let your inner monster out than Halloween! At Walking Mountains Science Center the 4th Annual Fright at the Museum is all about transformation. The theme is Mad Scientists, and the Halloween celebration will be filled with experiments in chemistry, the science of change, and tributes to classic monster movies with Frankenstein arts-and-crafts, an Electrifying Forest, and more. Join us on Saturday, October 22nd from 3:00pm-6:00pm at Walking Mountains Science Center in Avon, CO for a spooky afternoon of mad experiments and fun for all ages! The event sold out last year, so make sure to purchase your tickets today before they’re all gone! “Fright at the Museum is going to highlight monsters and the drama of explosive experiments while bringing together our community for a fun family celebration,” said Lara Carlson, Walking Mountains’ Community Programs Director. New for the event this year is Walking Mountains’ commitment to their role as a community leader in sustainability even during times of celebration. The Walking Mountains Green Team will be on site, keeping this event Actively Green, with a goal of minimizing the event’s carbon footprint. Recycling and reusing decorations/costumes/materials, and hosting the event at our LEED Platinum certified campus in Avon are just a couple ways we are focusing on sustainability. In addition, attendees are encouraged to carpool, bike, or walk to the event and to bring their own reusable water bottles. “It is really important to make this an Actively Green Certified Event. 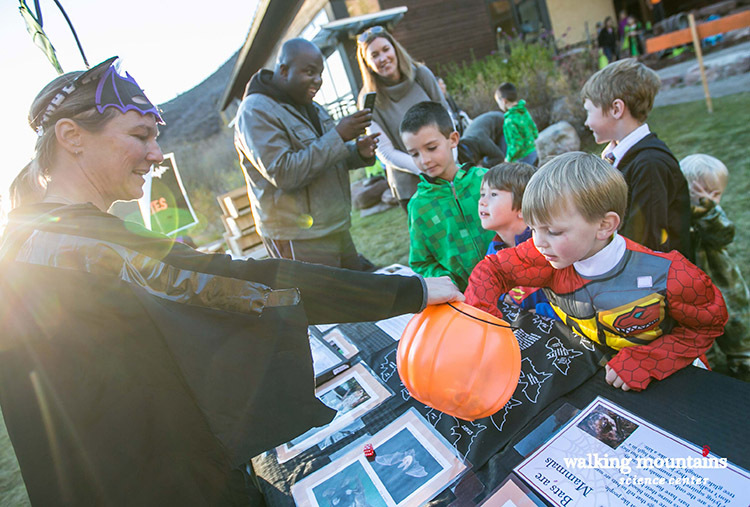 While it’s all about family Halloween fun, it’s also important to spread sustainability best practices and continue to be a leader in our community,” said Melissa Kirr, Walking Mountains’ Sustainability Programs Director. Mad Scientist Experiments – Enter their wacky laboratory and take over their zany experiments involving peculiar potions, concoct your own slime, dazzling density demonstrations, hair-raising electricity, madcap magnets, creepy crawly bugs, build a monster, and much more! Electrifying Forest – Travel through the spooky electrifying forest and solve the riddles to see Frankenstein and other Halloween monsters come to life! Generously sponsored by Holy Cross Energy. Frankenstein Monster Craft – Gather your materials and create a handmade creature worthy of taking home! Glow-in-the-Dark Mural – Enter a fun-filled dark, festive, and colorful room to experiment with different glow-in-the-dark materials and paints. Contribute your design to our glowing mural. Explosive Experiments – You don’t want to miss these fabulous, water-less, explosive fountain demonstrations that will take place every half hour! Generously sponsored by the Vail Daily. Face Painting – What is Halloween without a little face paint? Take some time to have our expert face painter get you in the Halloween mentality or add some style to the costume you are wearing. Giant Bubble Experiments – Bubbles are fun to chase, but can you manipulate the size, shape, or color of the bubbles you make? Conduct your own experiment and play with others’ concoctions. Costume Parade – It’s Halloween season, wear your Halloween costume when you come to Fright at the Museum. We will host a Costume Parade along our trails. Check out other costumes and show off your own Halloween personality! The Costume Parade is generously sponsored by Eagle County Schools. Tickets are $15 per person and children three and under are free. Costumes are highly encouraged! Purchase your tickets online in advance at www.walkingmountains.org/spooky. Last year’s event was sold out so purchase your tickets today. All proceeds from the event will go to support Walking Mountains Science Center programs that awaken a sense of wonder and inspire environmental stewardship and sustainability through natural science education. Fright at the Museum is sponsored by Eagle County Schools and the Vail Daily. Special thanks to Holy Cross Energy and G&K Services for their support.